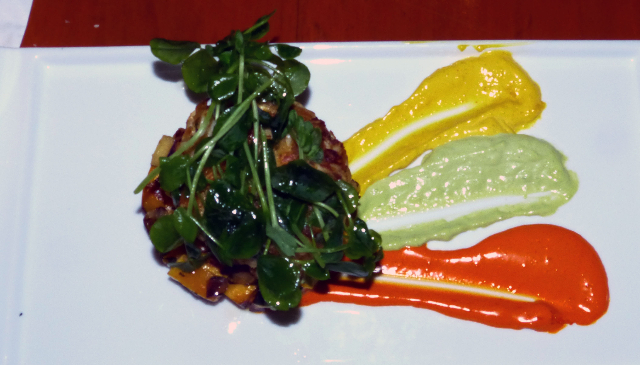 The vegetable hash that crab cake is layered over. 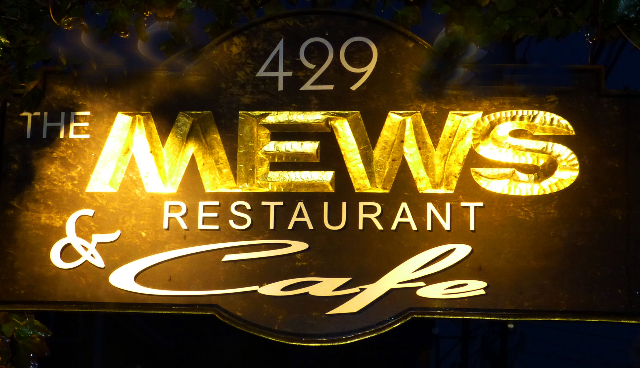 Mews is widely considered to be the top restaurant for fine dining in Provincetown. In a fishing village on lower Cape Cod, with so much competition, that’s saying a lot. 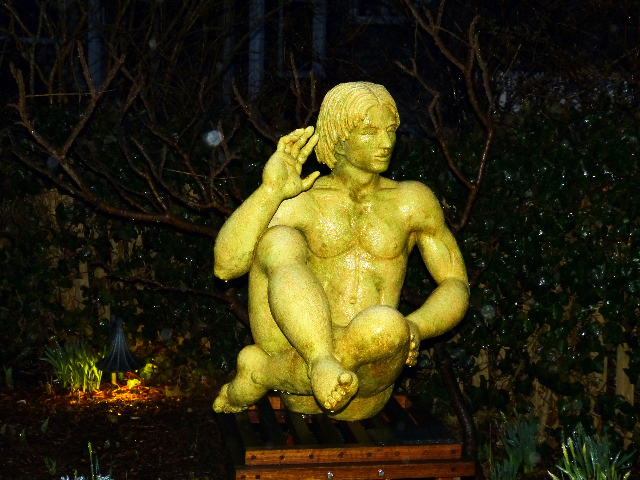 It was a weeknight in early April when, as suggested, we called for a reservation. That proved not to be necessary but arriving after 6 PM we were too late for a window, waterfront seat in the smallish and cozy dining room. Gradually the room filled to near capacity. Partly that’s because not many restaurants are open year round. On line I noted the Portuguese seafood soup but the waiter indicated that it had been removed from the new reduced Mews menu. One might consider it to be Mews greatest hits. He recited several specials but we went back to reviewing the standards. We glanced at the less expensive café menu. A woman seated alone at the bar was enjoying her $15 burger with several cocktails. You sensed that she was a local who came often. That appeared to be the case for a quartet of elderly gentleman downing cocktails as though they intended to live high on the hog now and forever. Just for one night we decided to blow through the inheritance and go for the whole enchilada. What the heck, you only come this way once, unless you are running buddies with Shirley MacClaine. We enjoyed a fresh basket of warm foccacia with an olive oil dip. For starters we shared a large crab cake ($15). It was attractively plated. The cake, chock full of fresh crab, was stacked high on a layer of vegetable hash, mostly consisting of diced roots. On top was a covering of wilted watercress. 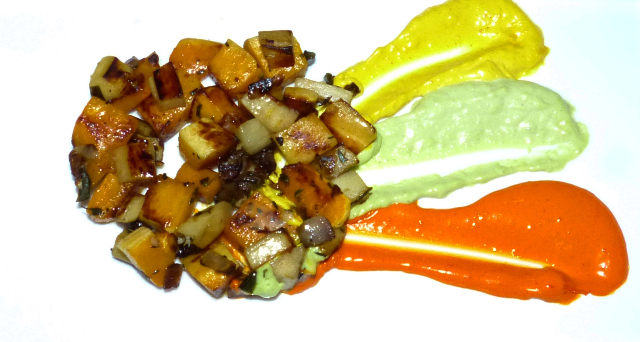 The plate was striped, flag-like, with three variations of aioli; with saffron, chive and paprika. Taking a fork of crab one dragged it though these sauces for varieties of slightly spicy flavor. Selecting from the menu was challenging with such enticing offerings. Their version of vindaloo was tempting. I chickened out but a neighboring diner ordered it. Unfortunately, we left before the dish arrived so we didn’t get to see him gasping for breath. His wife ordered the butter poached lobster and scallop creation ($34) which we also would have enjoyed at least looking at. When enjoying fancy dining it’s fun to rubberneck and see what other folks are enjoying. 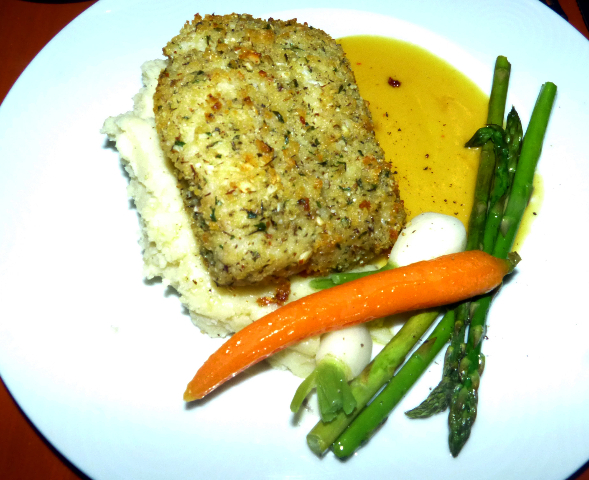 Being by the ocean I stayed away from mammals and ordered the almond crusted cod ($28). It was fresh and wonderful with a crispy coating cutting into flaky, perfectly prepared, thick-cut cod. It was placed over mashed potato with four arranged thin spears of asparagus. There was a single perfect slender carrot and two baby whole onions with their green stems left intact. After much deliberation Astrid ordered the wild mushroom and farro risotto ($22). The waiter explained that it is “like” a risotto which to me means creamy rice. What arrived was more like a whole grain concoction which she described as “more rustic than refined.” The vegetables mixed in were rather like the hash from the cab cake with hints of sliced oyster mushroom and another smaller, Japanese variety which she couldn’t quite identify. 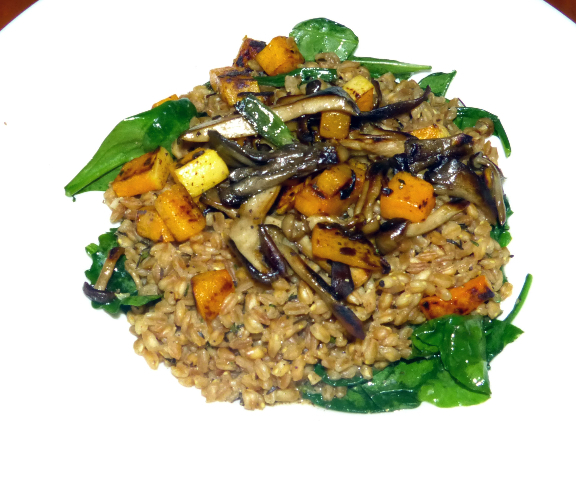 The “risotto” was layered in a shallow bowl over a bed of rainbow chard. The portion was ample and she took home about half for lunch. The crab was a hit but we ended with a split decision on the entrees. On this night cod proved to be the better dish. Overall, the prices are in line with other high end Cape restaurants. There is, of course, the option of downscaling to the café menu and still enjoying the five star seaside ambiance.